This better-for-you sundae is made with creamy vanilla yogurt, fresh strawberries, chocolate sauce, whipped cream, and a cherry! Line a small bowl or cup with sliced strawberries. Scoop the vanilla yogurt into the center of the strawberries. 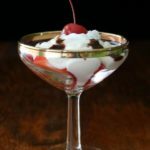 Top with whipped cream and garnish with a cherry. Serve immediately.